Snellville needs housing types other than single family homes. Snellville also needs stores, gas stations, restaurants and office suites. To accommodate those needs in a sensible manner, while protecting property owner rights and values, the city has developed a long term land use plan and established districts for specific types of development. Consequently, commercial establishments aren’t allowed in residential districts, and houses aren’t permitted in commercial districts. Those are black-and-white requirements, that don’t always apply in a world that is continually moving from one shade of gray to another. Consequently, the City has the means to address changing conditions and the developments proposed to meet them; a land owner or developer may apply to have a parcel of land (or several parcels) rezoned if a proposed development doesn’t fit the existing zoning requirements. Sometimes, such rezonings make sense and are of benefit to the community. Other times they don’t make sense or are potentially damaging to the community and therefore offer no benefit. 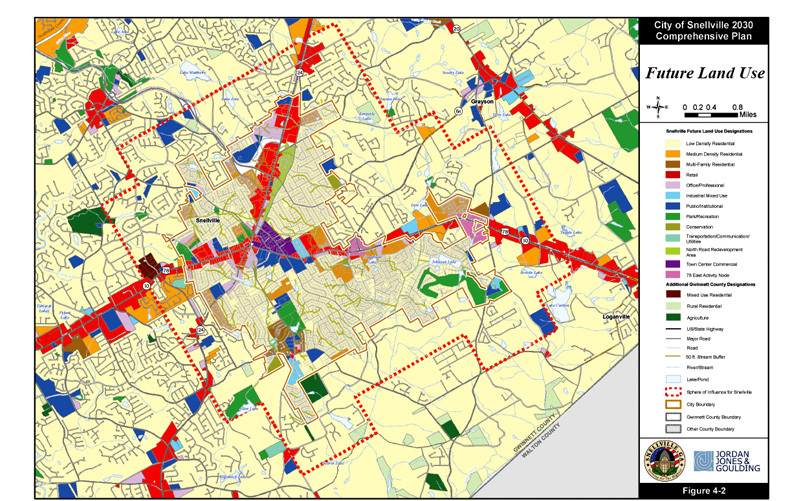 One arbiter of the sensibility of a proposed zoning change is the applicable “Character Area” description contained in the City’s long term land use plan, also called the Comprehensive Plan. Character areas are painted with a broad brush and define the overall look and feel of each section of the City. They are designed to provide guidelines for character-consistent, sensible and well-managed future growth. If a requested zoning is inconsistent with the character area in which it falls, the land use plan must be changed before rezoning changes can be approved. Parcels along Main Street and Highway 124 represent examples of sensible rezoning done in prior years. Once desirable areas for residences, land fronting these two highways now faces a busy thoroughfare with heavy traffic and all too often, congestion. Snellville’s growth and the resulting change in area environment has made these road-front properties more suitable for businesses and less desirable for houses. But before the properties along Main Street and Highway 124 could serve commercial purposes, they had to be, and were rezoned. Rezoning requests can incorporate a variety of changes within the commercial, residential, office/institutional and industrial parameters as some of these categories are comprised of a variety of districts. In 2014, Snellville received applications from two different development groups that wanted to build apartment complexes. Both applications were inconsistent with the land use plan and did not fit the current zoning. One group, Lynwood Development, determined it made more sense to abandon the apartment proposal and proceed with single family homes. The other group, never demonstrated any inclination to consider other options and proceeded with its apartment application, which was denied by the City Council. Brand’s displeasure with the denial and its lawsuit are no surprise. Throughout the entire application process, the developer’s representatives never appeared willing to consider or discuss anything other than their original proposal. That statement is in direct conflict with Brand’s claims, repeated in numerous meetings and presentations, that its apartments would be “high end”; the rates quoted by Brand representatives were higher than many families’ house payments. As for the “current demand for the proposed development”, it would appear that the developer is the only one making such demands. That brings into question whether Brand representatives were being forthright in their original statements or unaware of the dichotomy between “high end” and “affordable”. As a member of the City Council, I gave the same careful and thorough consideration to the Brand Properties proposal as I do to all development and zoning applications. Knowing my fellow Council members as I do, they did the same. Although the vocal opposition expressed by area residents received extensive media coverage, it was but one of numerous relevant considerations. Certainly, resident sentiment is a concern, as is a proposed development’s impact on traffic and schools. Compatibility with the land use plan is another important consideration as is environmental impact on the area and neighboring properties. The site of the proposed apartments has a host of environmental challenges, not the least of which is a tangible potential for the reduction of green space and alteration of wetland areas to cause the flooding of neighboring properties. In evaluating the extent of this particular development’s negative impact upon the area, it seems to loom as a multi-pronged assault against the community. Assault may ring out as too strong a word, yet in light of the lawsuit filed by Brand Properties, it seems entirely appropriate. It also seems entirely appropriate that I not merely maintain, but strengthen my commitment to defend our city against proposals that do not serve the best interests of our citizens. And although I can’t speak for them, I know that four other Council members share that commitment. Thank you for your stand against the building of apartments at a location which experiences significant traffic congestion on a daily basis. The building of these apartments would only make Snellville’s traffic issues worse!!!!!!!!!!!!!!!!!!!!! !